Nervous tissue is characterized as being excitable and capable of sending and receiving electrochemical signals that provide the body with information. 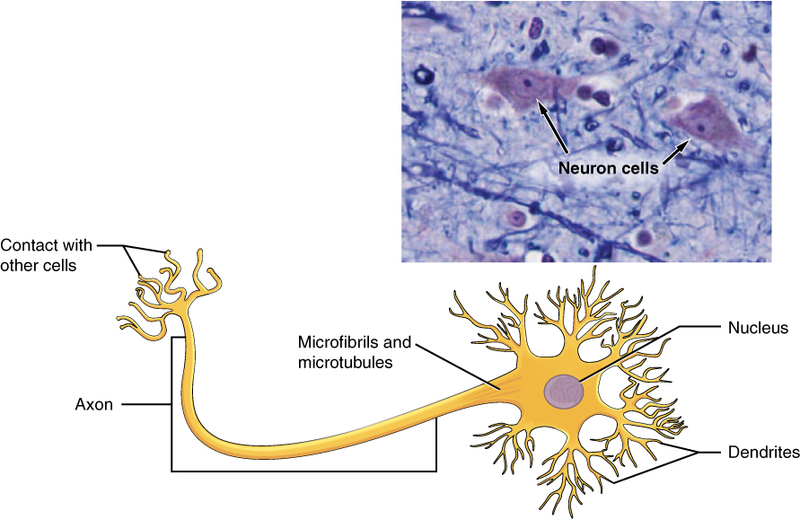 Two main classes of cells make up nervous tissue: the neuron and neuroglia (Figure 4.16). Neurons propagate information via electrochemical impulses, called action potentials, which are biochemically linked to the release of chemical signals. Neurons display distinctive morphology, well suited to their role as conducting cells. They have three main parts: (1) the cell body includes most of the cytoplasm, the organelles, and the nucleus (2) dendrites branch off the cell body and appear as thin extensions; dendrites receiving incoming stimuli and conduct information toward the cell body (3) the long “tail” is the axon and extends from the neuron body; the axon conducts impulses away from the cell body. Neuroglia play an essential role in supporting neurons and modulating their information propagation. Chapter 4. Authored by: OpenStax College. Provided by: Rice University. Located at: http://openstaxcollege.org/files/textbook_version/low_res_pdf/13/col11496-lr.pdf. Project: Anatomy & Physiology. License: CC BY: Attribution. License Terms: Download for free at http://cnx.org/content/col11496/latest/.